Whoever would have expected the generous, charitable, kindhearted citizens of America’s towns and cities to resist a federal program to resettle millions of unassimilable refugees who are mostly Muslims? Surely our elected officials and government functionaries know what’s best. 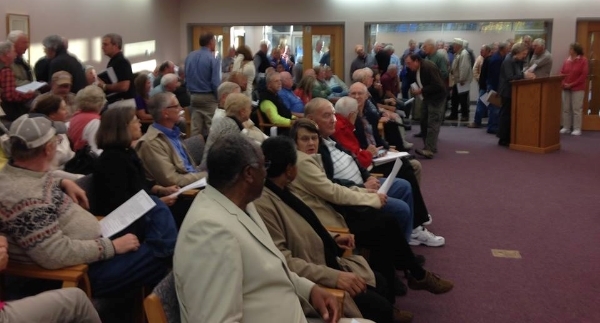 It was standing-room only at a council meeting in semi-rural Pickens County, South Carolina, Monday night, as residents flooded the chambers, many of them interested in one topic – the potential of Syrian Muslim refugees being resettled in their county. On Oct. 6 in Redlands, California, a woman affiliated with a local tea-party group stood up at a city council meeting and voiced her concerns about possible Muslim refugees being injected into the community from Syria. All of these developments have pro-immigrant groups worried about the growing “backlash” against America’s fast-growing population of recent immigrants and refugees from Muslim lands in the Middle East and Africa. From Syria alone, there will be 10,000 coming over the next year, and at least that many more in 2017. The Obama administration wants to bring nearly 200,000 refugees from all nations to the U.S. over the next 24 months. And the organizations that rake in millions of dollars in government cash working on these resettlements are getting nervous that their plans are coming under growing scrutiny at the local level. That much is evident by examining the presentations lined up for a major pro-immigration conference set in New York City in December. The conference includes break-out sessions on how to counter the growing “backlash” against refugees, “particularly Muslim refugees,” according to organizers of the National Immigrant Integration Conference. The theme of this year’s conference is “New American Dreams,” picking up the theme of the White House Taskforce on New Americans, which aims to convert 5 million refugees and recent immigrants into “New Americans” armed with full citizenship and voting rights. But every day more Americans are finding out how the refugee resettlement program works, and most of them don’t like what they see, says refugee watchdog Ann Corcoran, author of the Refugee Resettlement Watch blog. 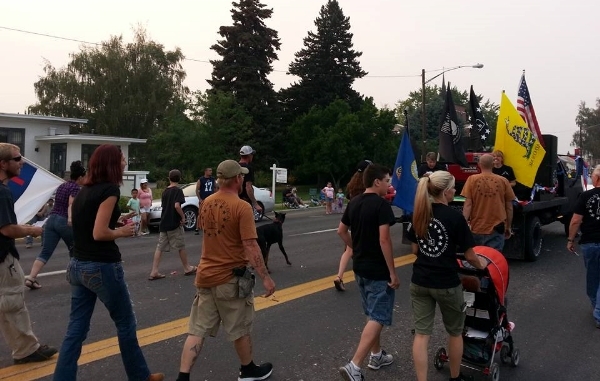 People are holding protest rallies in Idaho and petition drives in North Dakota. They’re approaching their city and county leaders with questions in California, Pennsylvania, Michigan and Minnesota. And in South Carolina, grassroots activists are educating their local leaders and asking them to block the arrival of refugees. It happened Monday night in Pickens County, where the county council voted unanimously to block funding for any federal refugee resettlements, citing costs and security concerns. But Corcoran said there is plenty that citizen activists can do at the grassroots level to cause problems for pushers of refugee resettlement. An informed citizenry is their “worst nightmare,” she said. This is an industry that, until recently, had operated below the radar in nearly 200 cities across 48 states. A network of church groups, nonprofits and foundations has worked quietly with the federal government and the United Nations to bring more than 3 million foreign refugees into the United States since 1990, about half of them from Muslim-dominated countries with heavy jihadist populations like Somalia, Afghanistan, Iraq and now Syria. It is also a system that is inherently biased against the most persecuted group of refugees in the world – Christians, Corcoran said. More than 97 percent of the nearly 2,000 Syrians resettled in the United States so far have been Muslim, for instance. In an effort to counter the pushback, the issue will be taken up at the nation’s largest pro-immigrant conference Dec. 13-15 in New York City. An entire breakout session will address the growing challenges to Muslim resettlement in the United States. The “experts” from the Muslim community are likely to be affiliated with the Council for Islamic-American Relations or CAIR, a Muslim civil liberties organization with ties to the international Muslim Brotherhood and Hamas. These ties are documented in the court records of the 2007 Holy Land Foundation trial, the largest terror-financing trial ever conducted on U.S. soil. See WND’s Rogue’s Gallery of terror-connected CAIR officials. As for the “key actors” who are fueling the pushback against refugees, critics say law-abiding Americans concerned about the safety and security of their communities have every right to speak out and ask questions. 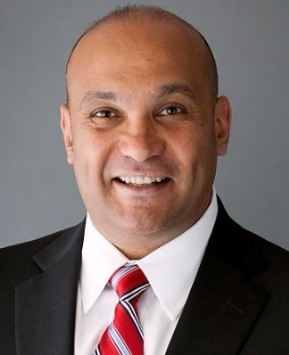 Dr. Mark Christian, a former child imam born into a prominent Muslim family in Egypt who later broke away from the Islamic faith and became a Christian, said the “key actors” driving the backlash against Muslim immigration are the Muslims themselves. Christian called it “an atrocity” to “blame the messenger” instead of looking at the main message of violence that is going out from Muslims worldwide. The local democratic process – where local residents attend local meetings and ask pointed questions of their local elected representatives – is deemed offensive to the refugee resettlers, Corcoran said. They would rather meet behind closed doors with pre-invited “stakeholders,” but citizen activists are demanding more transparency in the refugee resettlement process. This strategy of demonization is playing out with limited success around the country. On Oct. 6, a tea-party group approached the city council in Redlands, California, and asked representatives on the council to put out a plan for keeping the city safe from any potential Syrian refugee resettlements. The Redlands Daily Facts reported that Victoria Hargrave, a local resident affiliated with the tea party, stood up at her local council meeting and said, “Our nation is based on Judeo-Christian beliefs, and we value freedom of speech, freedom of religion and property rights as protected by the Constitution.” She said Muslims reject these values and are coming to America to impose Shariah law. The local newspaper followed up by calling the regional CAIR leader, who berated Hargrave and those she represented as ignorant bigots. “This paranoia and phobia is rooted in a combination of ignorance and bigotry,” Hussam Ayloush, executive director of the Los Angeles CAIR chapter and chairman of the Syrian American Council, told the newspaper about the Redlands tea-party concerns. The Islamic Community Center of Redlands invited the public to an “Open Mosque Day” in the wake of Hargrave’s comments at the council meeting. The conference in New York will offer another breakout session on “How new waves of Asian and African migration are transforming receiving communities.” The term “Asians” includes those from the Middle East including Iraq, Iran, Burma, Afghanistan and Pakistan – all of which are sending Muslims to the U.S. In this session, the presenters brag about how they are “transforming” communities and creating “shifts in influence” that lead to “changing the narrative on immigration” by sending “new waves” of Muslims from the Middle East and Africa into communities nationwide. While the backlash against Muslim refugees has started to resonate with some local officials in conservative areas of the nation, others remain dead-set on bringing in more refugees from some of the worst jihadist hotbeds of the world, such as Syria, Afghanistan and Somalia. 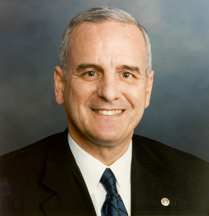 And they’re not all Democrats like Dayton in Minnesota. GOP Gov. Nikki Haley of South Carolina told her state’s concerned citizens she “trusts” the federal government’s vetting system and is not concerned that terrorists could infiltrate the ranks of refugees. This despite the fact that a top FBI counter-terrorism agent testified before the House Homeland Security committee on Feb. 11 and said vetting refugees from a “failed state” like Syria was virtually impossible. Republican Gov. Rick Snyder of Michigan has asked the federal government to send more Syrian refugees to his state. “… the boy blunder, will do anything to help the democrat voter base … yet as a Service Connected veteran I cannot get an anti-biotic for a impacted tooth,” wrote one reader, Elmo Hickey. 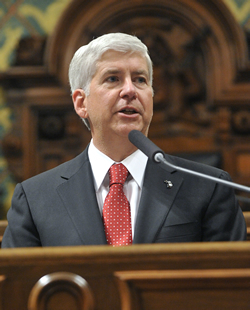 “What is Snyder’s plan for keeping political Islam out of Detroit and addressing it elsewhere in Michigan? He better have a plan because he is opening the door to many who will not respect our Constitution or our political system. I suggest you call his office and see what kind of response you get. As usual, he has not thought this trough assessing the probable consequences,” wrote Clifton Dawley. Besides the many governors like Dayton, Haley and Snyder, 18 mayors across the nation are also begging the federal government to send them more Syrian refugees. One such mayor is Ed Pawlowski of Allentown, Pennsylvania. As NPR reported Monday, Pawlowski said he received more than 2,000 email messages within 24 hours when he announced his intent to “welcome” Syrian refugees to his town. He said most of the messages came from outside his city. At a recent informational meeting put on by a Lutheran-affiliated resettlement agency in Allentown, the agency “got more than they bargained for” when a group of tea-party activists showed up, reported the Morning Call. People started asking questions about costs to local school and health systems, and security concerns about potential terrorists. A check of the IRS tax return for the Lutheran Family and Children Services of Eastern Pennsylvania shows that its CEO, Luanne Fisher, makes $400,000 a year and three other staffers bring home six-figure salaries. Almost $9 million of the nonprofit’s $14 million in revenue went to salaries, pensions, benefits and management, not to the refugees. Of its $14 million in revenue, $13.5 million comes from government grants. Read letter signed by 18 mayors explaining whey they want more refugees sent to their cities. Corcoran points out that because so many cities and towns have balked at receiving refugees, the resettlement industry is increasingly looking to spread refugees out beyond the major cities. “They’re running out of places to put them,” she said, and that’s why even small towns are being asked to share the burden. Small cities like Twin Falls, Idaho; Fargo, North Dakota; and Spartanburg, South Carolina, have seen a war of words break out in recent months between those who want to “welcome the stranger” and those who suggest a more cautious approach. Johnnelle Raines, a local activist in Pickens County, South Carolina, said she has immersed herself in the refugee issue over the past two months, learning all she can about it and relaying the facts to her local council members. She said they were reluctant at first but the more they read and educated themselves, they decided the program would import the problems of the Third World into an area that already has enough of its own problems. Raines said she believes many refugees from Muslim-dominated countries will not assimilate well into American culture. asylum, invasion, Legal Immigrants For America, LIFA, Muslim, refugee, Refugee Resettlement Watch, resettlement. Bookmark.